Get on your fish-painting duds: It’s Dungeness River Festival time again! Every year, local, state, federal, tribal, and non-profit groups provide interactive exhibits and walks for the whole family that examine and celebrate the watershed that keeps the Sequim-Dungeness Valley alive – and that’s not all! The Dungeness River Festival also serves up live music, food and drink, crafts, and more! In addition to fun exhibits, presentations, live music, food and dancing, the annual Dungeness River Festival also showcases the creativity of local artists with the Olympic Driftwood Sculptors Art Show. 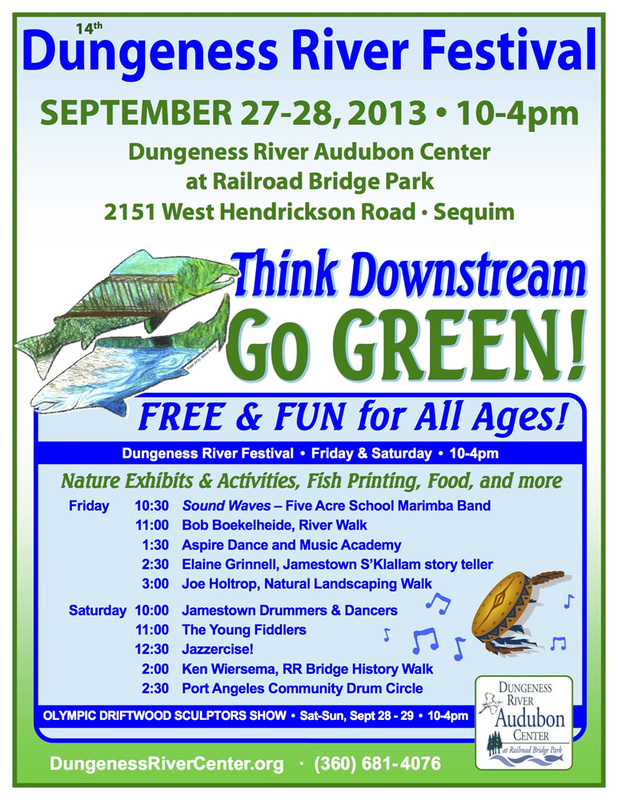 The annual Dungeness River Festival celebrates the waters that are so precious to the Sequim-Dungeness Valley. Every year, local, state, federal, tribal and non-profit entities active in the Dungeness watershed provide interactive, educational exhibits for the enjoyment of all ages. In addition to the fun exhibits, the festival entertains visitors with live music, food, nature walks and more. The theme for this year’s Dungeness River Festival is “Let’s Go Green!” In keeping with this theme, the 2012 River Festival in Sequim will be offering a new event: Landscaping with Nature. On Friday at 2:30 pm, Joe Holtrop, District Manager of the Clallam Conservation District, will give a presentation in the Dungeness River Audubon Center. Afterwards, he will lead a walk in Railroad Bridge Park. Property owners and gardeners will be sure to learn a great deal from Joe’s many years of experience in sustainable landscaping. On Friday, the Five Acre School band, Sound Waves, will play marimba music that will make you want to dance! They will play two sets on the River Stage, one at 10:30 am and another at 12:30 pm. For Friday’s events, children will be visiting on school field trips to take part in the day’s activities. They can play the ‘Animal Olympics,’ enjoy the educational games provided by the exhibitors and, if they bring a T-shirt or pillow case, they can make their very own fish print. These are just a few of the fun ways the festival inspires a sense of stewardship in the next generation. On Saturday, highlight events include the 10 am traditional welcoming ceremony by the Jamestown S’Klallam drummers and singers. Festival goers can also see beautiful artwork by the Olympic Driftwood Sculptors. Their fourth annual art show will take place in the River Center both Saturday and Sunday from 10 am to 4 pm. Saturday also features fun dancing events with the Olympic Mountain Cloggers at 11 am and zumba at 12:30 pm. The afternoon delights continue with ongoing exhibitions, Music in the Park, and a drumming circle. 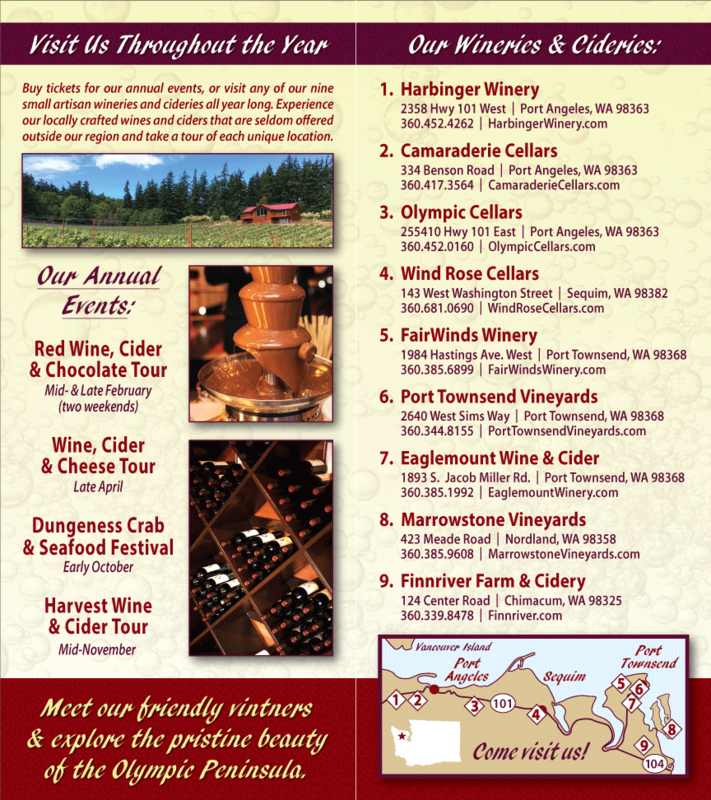 For more information on this family-friendly Sequim, WA event, visit DungenessRiverCenter.org.